Visual Storyboard - the overall look and feel of the space! 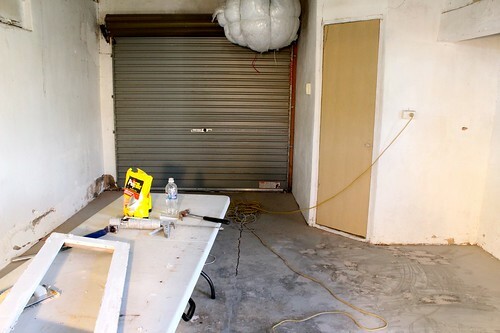 Exciting news, we are currently half way through our garage renovation to convert it into a photographic studio. Denis and I both work from home, and we are lucky we have enough space to have our own dedicated work areas! I currently work upstairs, and this wonderful space is going to be Denis's pad. Lucky boy! So while Denis is doing the hard stuff, I have been starting to design the interior. Trying to incorporate touches of a 1950s beach side theme to suit the studio location, working within a strict budget and utilising our existing furniture, second-hand and hard rubbish finds! I'm totally in love with the vintage inspired beachy fabric from Mini Moderns. I have a couple of teak chairs to cover, so better get onto that soon! 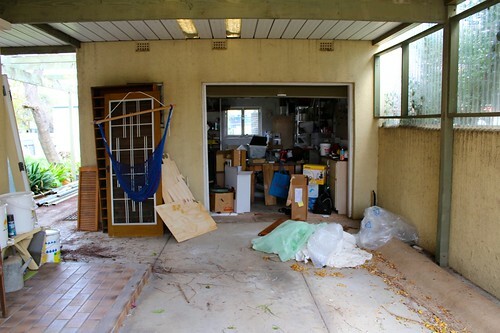 Mmmmm, the state of the garage before we started! Being a collector of 'things', first we had to decide what to do with our 'things' being stored in the garage. 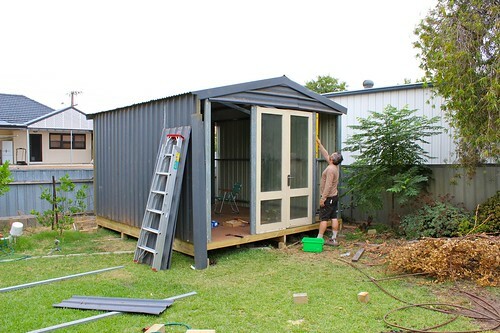 I found this cute shed on ebay which was dismantled and delivered to us all for the bargain price of $500. At first I thought it would be too big, but now that we have transferred all of our 'things' over to the shed it is actually the perfect size. And yes, the french doors came with it too! The little room on the right is actually a bathroom. While the house was being built, the garage was home to the original family who lived here! 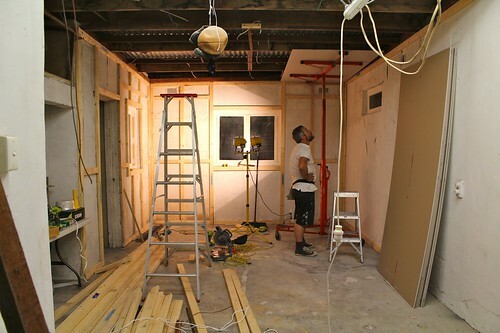 Walls framed and ceiling going up. Mmmm the wall is not straight! Ceiling and gib complete, planning the ply feature wall. 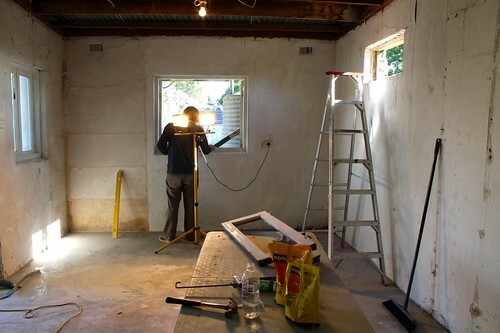 Denis spent heaps of time repairing the wooden frames to retain all of the original windows. 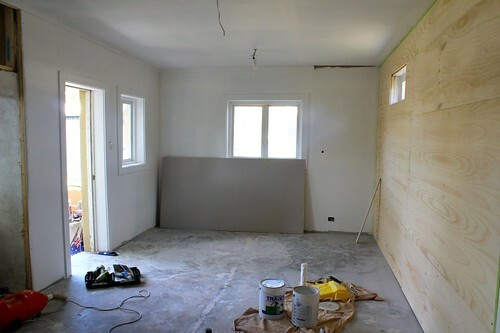 He also decided to line the original block walls with Gib - a quick, easy and cheap way to prep the space for painting. And for a bit of extra character, we decided to work in a feature ply wood wall. Ply up and undercoat complete - looking mighty fine! The amazing seamless wall (to be used as a photo backdrop). 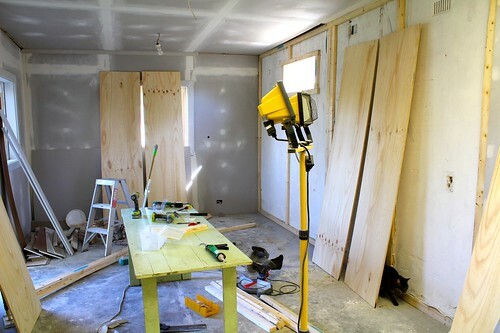 I'm really happy with the ply sheets we sourced from Bunnings. They have such a lovely wood grain, and mounting them in large long panels helps to give the illusion of more space and length to the room. And check out the amazing photo backdrop Denis built. 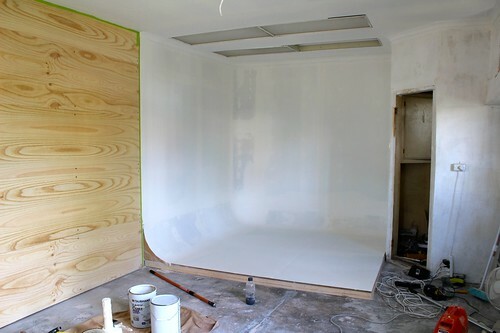 It's a seamless white wall (no sharp corners) that will be used for product and fashion shots, and also video interviews.